Complete and awaiting a trim and stretch by a professional carpet fitter. This is key to avoid any creep, creases or rolls in the future. • Cabinet linings in European Oak (acrylic matt). • Face framing, doors, top and back panels in Joa’s White (Farrow & Ball paints). • Custom door design in harmony with existing internal Oak doors (see picture). • Pilkington toughened glazing and polished edge adjustable shelves. • Switched LED down lights. • Brushed s/steel door buttons. • Flatscreen TV on swing-out bracket with a concealed cable run to lower media cabinet. 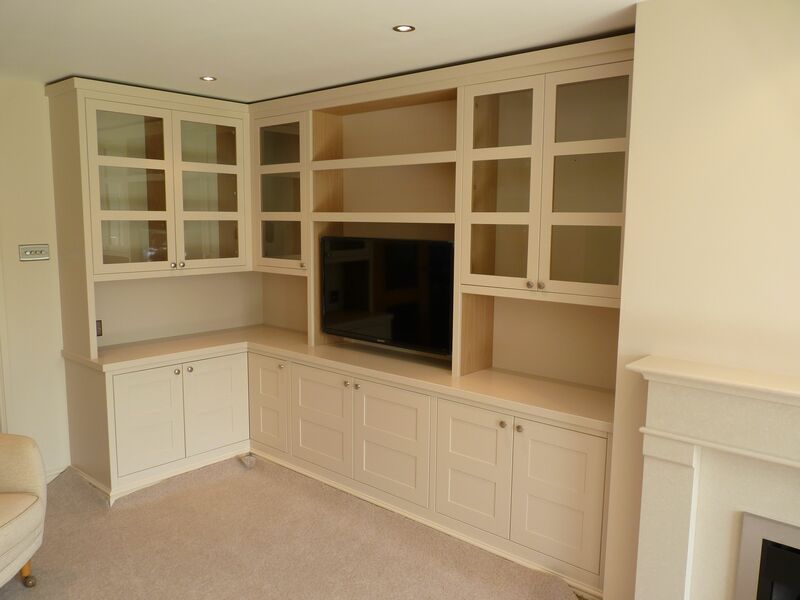 This entry was posted in Cabinetry and tagged alcove cabinetry, built in cabinetry, european oak, hand painted, media cabinetry.